Republican presidential hopeful and former Arkansas governor Mike Huckabee campaigns in Windham, New Hampshire. There's a reason they call it "The Firewall." From its inception, the South Carolina Republican primary was meant to disrupt and destroy the flames of political passion. Lee Atwater, the party's onetime strategic wizard, designed the thing to give conservative southerners a say in the presidential process and offer churchgoers a power line to the White House. Then he put it on the calendar right after Iowa and New Hampshire, the ideal spot for the party establishment to kill an insurgent candidate's momentum. So it was that South Carolina stopped Bob Dole in 1988, handing the nomination to the establishment candidate, George Bush, the father. Then again in 2000, John McCain lost his cool and his lead in the face of a revolt from the party base, which chose another establishment candidate, George Bush, the son. Now the state looms again as a candidate killer. "Since 1980, the person who won two out of [the first] three states has gone on to get the nomination," McCain often tells reporters on the trail. They are words that might come back to haunt him. Even though he leaves New Hampshire a victor, with a head full of steam, it appears to the voters in South Carolina that John McCain  long in the tooth and the Senate  is still an insurgent. McCain's immediate problem in South Carolina is his ally from Iowa and New Hampshire. Mike Huckabee, a former Baptist pastor, has been polling with a double-digit lead among the state's heavily Baptist electorate. For weeks the two men have praised each other talents and made common cause against their well-funded adversary, Mitt Romney, who will try to salvage his wounded campaign next week with a win in Michigan on January 15, four days before the vote in South Carolina. "It's not that we don't recognize that we are competing for the same job," Huckabee said of McCain, last week. "But I think we also recognize that it can be done in a civil manner. And we are both committed to that." Perhaps the biggest factor separating the two men is simple demographics. 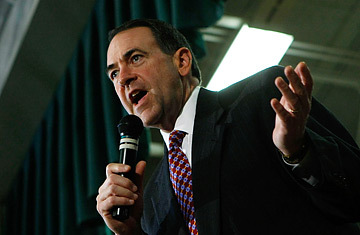 As in Iowa, Huckabee finds himself with a direct line to the evangelical voters who dominate the Republican base. David Woodard, who helps run the Clemson University Palmetto Poll, says that over the last 20 years, between 60 and 70 percent of the state's likely Republican primary voters have gone to church at least once a week. Of that group, about half are Southern Baptist, the faith of the pastor-turned-politician Huckabee. "When he won in Iowa, that gave him a lot of credibility across the state," says Woodard, pointing to the polls. "It was a tidal wave." McCain is also still recovering from the July implosion of his campaign, which resulted in pink slips for most of his staff in the state. Voters, already upset by McCain's support of an immigration reform bill in Congress, gave up on him. "They thought that the campaign was over," says Trey Walker, McCain's campaign manager in the state. But Walker remains optimistic. "The McCain resurgence is palpable," he said, adding that the campaign was now at about three-quarters its pre-July stength. Other x-factors wait in the wings. Fred Thompson, the onetime darling of southern conservatives with an endorsement from National Right to Life, has mounted an aggressive bus tour across the state as a last-ditch effort to save his foundering campaign. If he regains momentum, he could eat back into Huckabee's support among the pro-life base of the party. Similarly, Romney retains a well-funded operation, with heavy television ad buys and near daily direct mail drops. "It's still bunched up," said Warren Tompkins, Romney's consultant in the state, putting an optimistic spin on the recent polling. On Tuesday, Huckabee's South Carolina chairman, the state's former governor, David Beasley, flew north to stand behind Huckabee when he celebrated his third-place finish in New Hampshire. In an interview afterward, Beasley argued that Huckabee could be an unstoppable force, marrying both an insurgent appeal and an establishment tie to the state as a fellow southern governor. "McCain will get a small bump," Beasley said of the Arizona Senator's New Hampshire victory. But he predicted that it would not be enough. In 2000, Beasley backed another southern governor, George W. Bush, in a triumph over McCain. Eight years later, he saw history repeating itself. "That's why South Carolina is known as the firewall," he said, smiling.